It’s exciting, Newcastle is signed up to develop Strategic Cycle Routes. Wondering what you as Councillor can do for cycling and cyclists? Some call the cycling community “complex”. We think it’s simple! Get in touch to find out. Here’s also a few ideas to test and use. Please get in touch to discuss your projects, ideas or simply to find out what we think. We would like to share some awesome data sources. This could be useful to Councillors who want to get under the skin of their ward and city, or for the general public to check out the lie of the land for transport, health and general demographics. 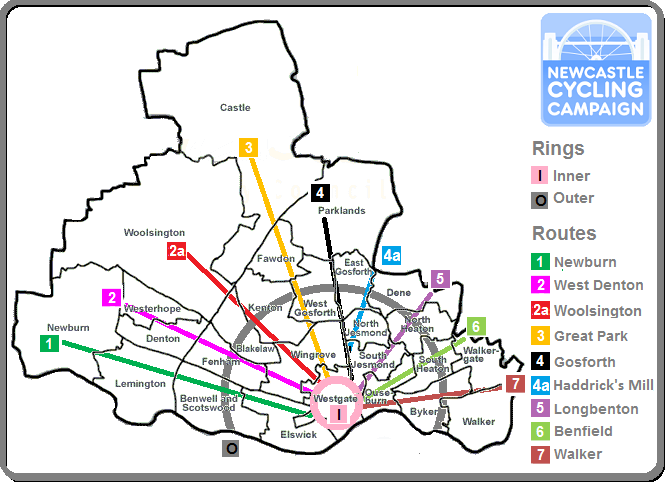 Newcastle is a trip attractor: the map shows why we should be building cycle routes into the city centre, such as the Strategic Cycle Routes (SCRs). Check out the SCR in your ward.